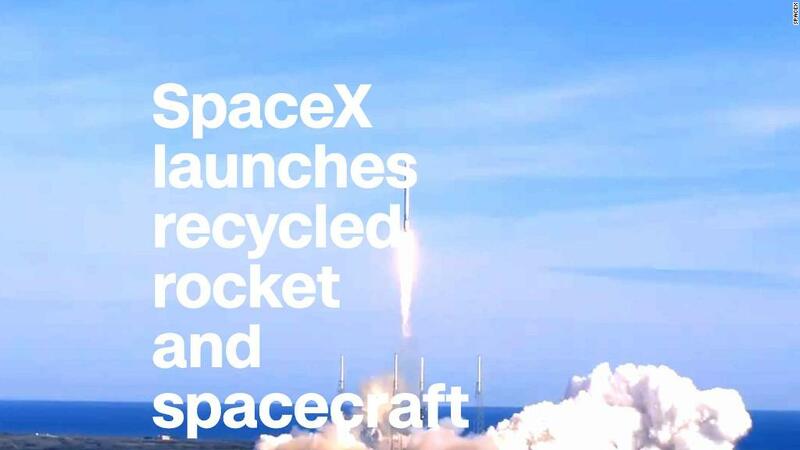 SpaceX made another huge step toward becoming the space industry's king of reusable hardware. On Friday it launched a used spacecraft (the Dragon) on top of a partially used rocket (the Falcon 9) for the first time ever. Liftoff occurred just before 10:40 a.m. ET at the Cape Canaveral Air Force Station in Florida, and everything went off without a hitch. The first-stage Falcon 9 booster used in Friday's launch was safely recovered once again, so it could potentially be used in a third mission. The fact that SpaceX can re-fly large portions of its hardware is a big deal. Not long ago, many in the space industry didn't think it could be done. It's a stunning feat because it allows SpaceX to cheapen the price of a single launch. Friday's mission is part of SpaceX's ongoing partnership with NASA to complete unmanned trips to the International Space Station. SpaceX's Dragon spacecraft will dock at the station on Sunday. On board is more than 4,800 pounds of cargo, including science experiments and supplies for the crew. Among the haul of research supplies: A batch of barley seeds that's part of a Budweiser-backed experiment to brew better beer. Ricardo Marques, the company's vice president of marketing, told CNNMoney last week that it is in-part a marketing scheme. But "there's a lot of scientific horsepower behind this experiment," he said. The barley experiment could help scientists better understand the seeds and the best way to grow them back here on Earth. Six people are currently on board the space station -- three NASA astronauts, two Russian cosmonauts and one Italian astronaut. SpaceX has flown a used rocket booster three times before. And it's launched a used Dragon spacecraft once before. Friday marked the first time both the rocket and spacecraft used at launch had already made grueling trips to space. This was the first launch for SpaceX since October 30. It's endured a series of delays for various reasons. One mission, a top-secret launch for the U.S. government, was supposed to occur in mid-November, but it's since been delayed until January. SpaceX cited an issue with the rocket's fairing -- the very top portion of the rocket that can house a payload, such as a satellite -- as the issue. Friday's mission didn't need a fairing because the Dragon spacecraft can fly solo atop the Falcon 9. But this space station mission wasn't exactly on time. It was delayed once to allow for additional "ground system checks," and again when SpaceX detected "particles" in the second-stage rocket booster's fuel system. Nonetheless, SpaceX has had a stunning comeback year. Last year, SpaceX suffered a major setback when one of its rockets spontaneously exploded on the launch pad in September, destroying the payload. That left the company grounded for months. But SpaceX had a stellar rebound in 2017 by executing 17 launches -- more than any other private-sector launch provider in the world. That makes it the firm's busiest year yet. For comparison, SpaceX launched just eight times in 2016. The company has one more launch slated for 2017 on December 22.